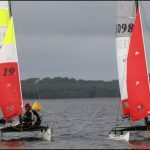 The day before the event, sailors from all French regions were able to prepare their boat under a relatively dry weather, except between 3PM and 4PM, when the Lake was struck by a sudden storm that brought 30 knot winds. The first day, no-wind conditions forced crews to stay ashore. The decision of cancelling races of the day was taken at 3PM, before 6 hours waiting time. Nevermind. 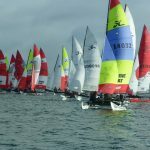 The commitment of sailors to fight for the title of French Champion led lots of them to fine-tune adjustments and polish their boat. 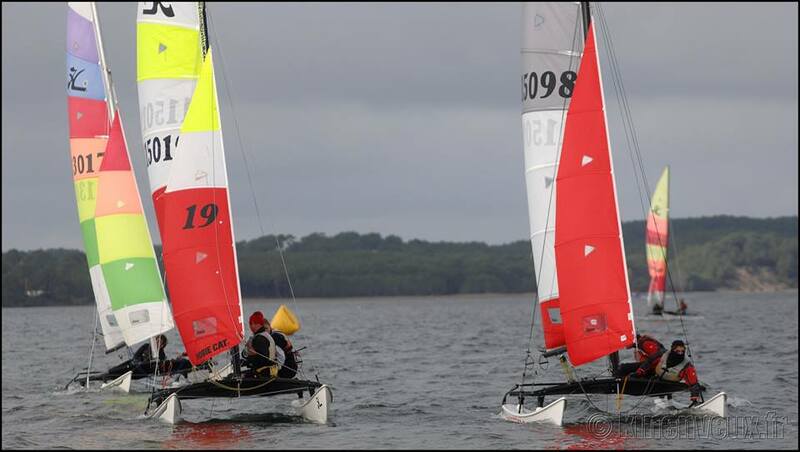 The second day, the first race was advanced at 10AM (instead of 11AM). 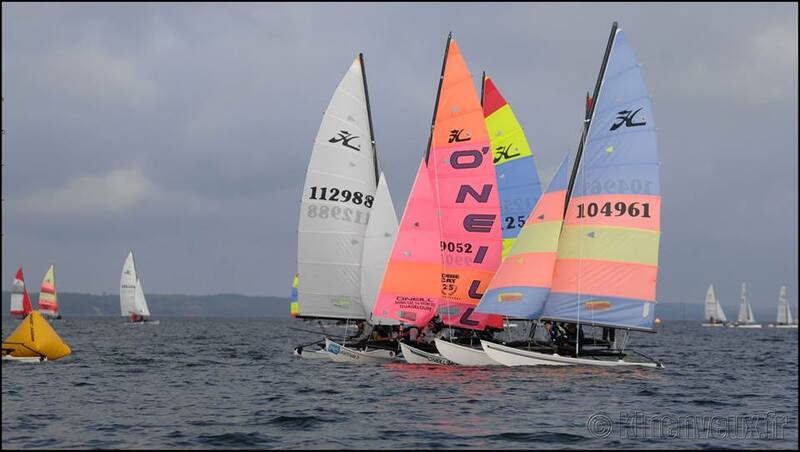 4 races have been sailed under good wind conditions (between 5 and 12 knots). 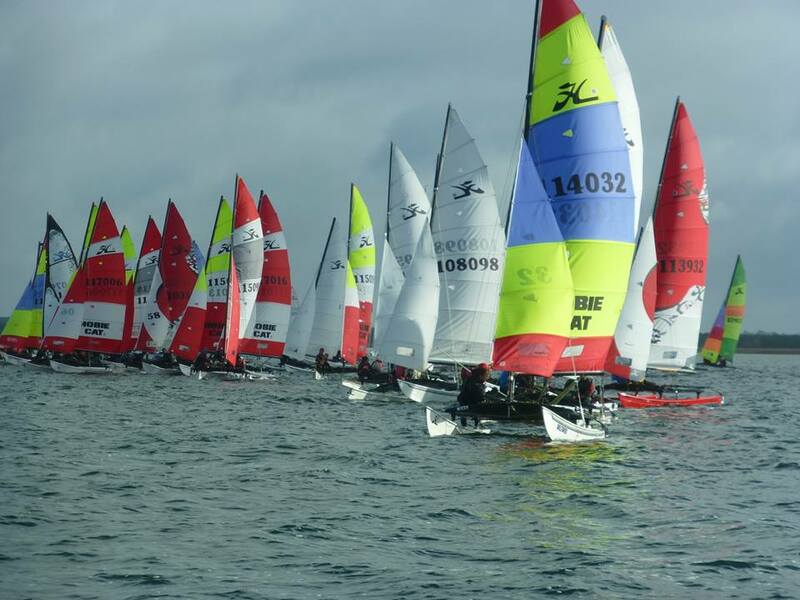 However, due to the complexity of the waterbody and the competitiveness of sailors, some races started under black flag. 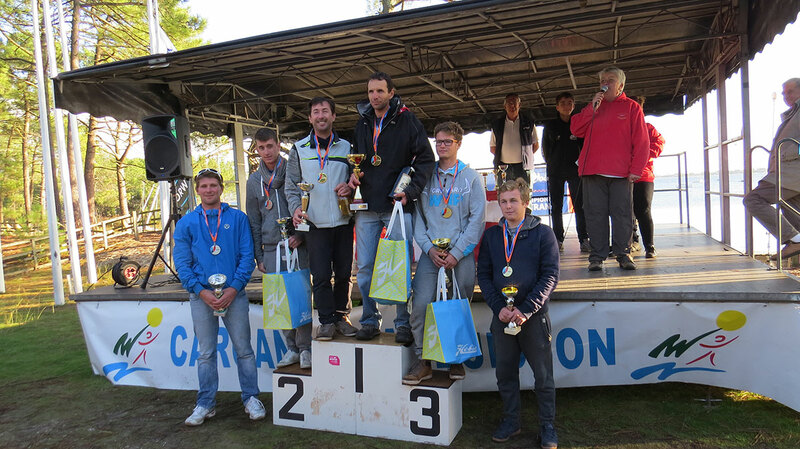 At the end of the first day racing, Laurent Bader (the last European Hobie Cat 16 Champion-Austria 2016) and Antoine Mayet took the first place ahead the team Arthur Boc-ho and Thibault Chauveau (last French Hobie Cat 16 spi Champions-Lancieux 2016), and the team Arnaud Thieme (World Hobie Cat 14 Champion-Travemunde 2013) and Ludovic Siguret (French Hobie Cat 16 Classic Champion – Marseille 2014). 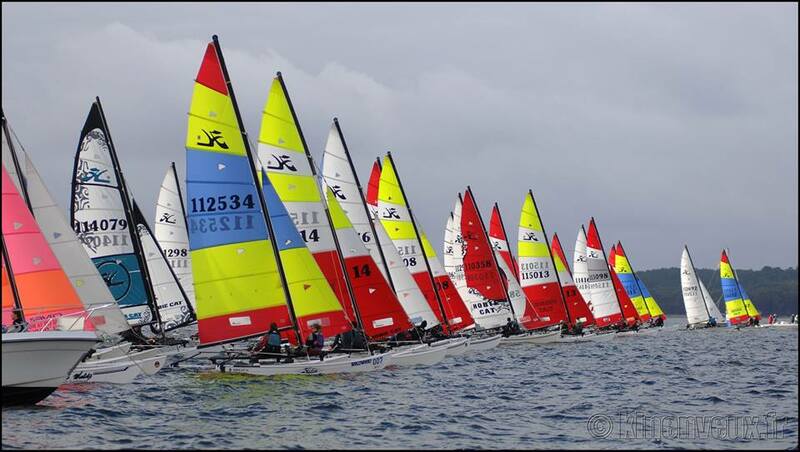 The third day, 3 races were launched between 10AM and 2PM. 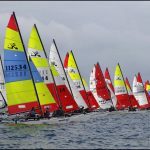 At the end of these 3 days of competition, Arnaud Thieme and Ludovic Siguret finally top the first place ahead Laurent Bader and Antoine Mayet, and Arthur Boc-ho and Thibault Chauveau, with 22, 23 and 31 points respectively. 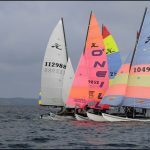 We should also highlight the great result of the first female crew, Morgane Gombaud and Marjorie Duret (CN Meschers), which took the 4th place of the ranking after winning the 2nd race of the Championship. Do not miss the next major event! 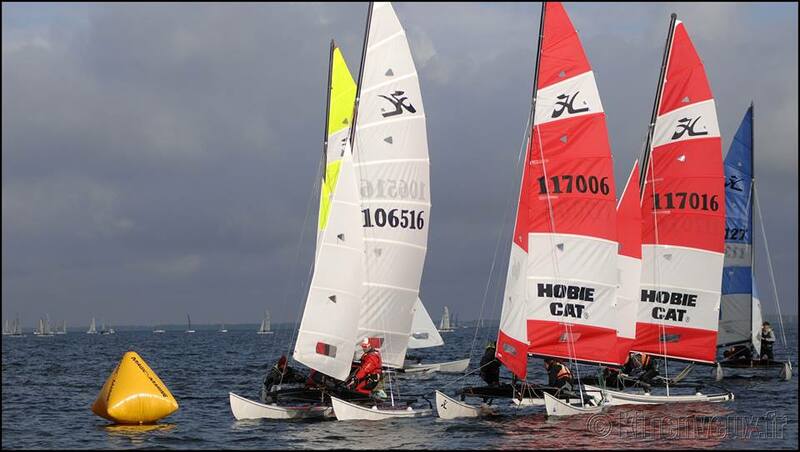 From the 3rd to the 5th of June 2017, the annual French Hobie Championships will hold in Châtelaillon-Plage (Charente Maritime) and will be organized by the Châtelaillon Sailing Club. You are convinced to take part in the event! 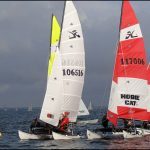 Wild Cat, Tiger, Dragoon, Hobie Cat 14, Hobie Cat 16 Classic, Hobie Cat 16 spi… you are all welcome! Follow all information about this event on our Facebook page!